10-Day Perth to Kalbarri Itinerary. WA’s Coral Coast region boasts some of Australia’s most pristine beaches – perfect for swimming, fishing or simply sitting back and enjoying the sunset. 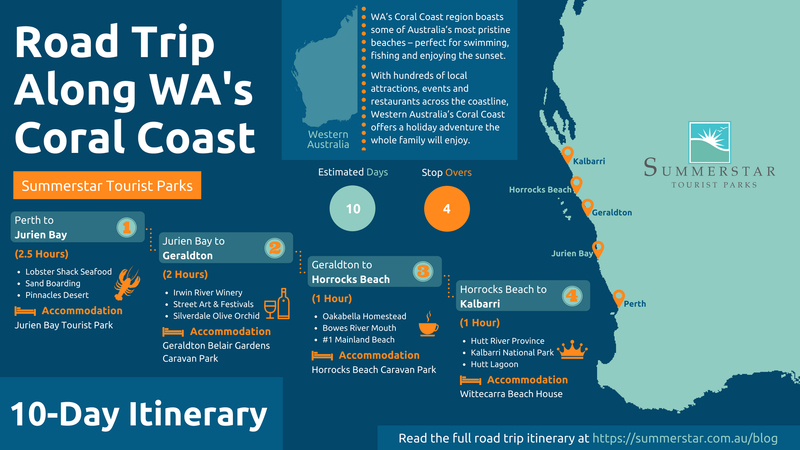 With hundreds of local attractions, events and restaurants across the coastline, Western Australia’s Coral Coast offers a holiday adventure the whole family will enjoy. So, pack your clothes, load up the car and book your accommodation before setting out on Summerstar’s 10-day itinerary from Perth to Kalbarri. Head out of Perth along Indian Ocean Drive, travelling to the coastal town of Lancelin. Stop off for a mini adventure of sand boarding or four-wheel driving on WA’s largest sand dunes. Continue north to the crayfish capital of Cervantes in time for a scrumptious seafood lunch at the Lobster Shack. Then head to Lake Thetis on the fringe of town and see some of the oldest living fossils on Earth. Take a detour to the Pinnacles Desert and take a meandering drive right through the curious limestone spires that were formed over millions of years. Just 20 minutes’ drive north of Cervantes, is the coastal community of Jurien Bay – located right on the spectacular Coral Coast of WA. Roberts Street, Jurien Bay WA 6516, Australia. Jurien Bay Tourist Park rests in the heart of the townsite of Jurien and only steps away from the beach. Featuring holiday units and powered and unpowered camping sites. Continue north towards the historic towns of Port Denison and Dongara. Whilst there head out to the award-winning Irwin River Winery then continue to Silverdale Olive Orchid. Head further north travelling through historical Greenough before arriving at the trendy WA Coral Coast city of Geraldton. A seaside regional city with street art, festivals, shopping and indigenous trails, it makes a great base for exploring WA’s Batavia Coast. Be sure to head up to the impressive HMAS Sydney II Memorial, commemorating the lives of sailors who died in World War II. 463 Marine Terrace, Geraldton WA 6530, Australia. Just 250m from the waterfront, and only 5 minutes from the town centre. Featuring a range of accommodation from powered and unpowered camping sites to holiday units and long-stay cabins. Head north 40 minutes out of town to Oakabella Homestead for a leisurely morning tea or lunch. Then continue to the historical Northampton, just a short drive away. Stop into the visitor centre, itself of historical significance, as it was formerly the town’s police station, built in 1882. Continue west 25km towards Horrocks Beach, voted Australia’s Number 1 Mainland Beach. Horrocks is truly a unique destination, offering a quiet and unspoilt holiday atmosphere during your travels along Western Australia’s Coral Coast. Just a few minutes from town is the Bowes River Mouth, featuring picturesque and rewarding picnic areas, wildflower and fishing spots. 1 North Court, Horrocks WA 6535, Australia. Horrocks Beach Park, located in the centre of town and adjacent to the beach. Featuring park both holiday units and powered and unpowered camping sites. Head north via Northampton and just a 40-minute drive on you will arrive at Hutt River Province, Australia’s only independent sovereign state. Take a tour with a member of the royal family and have your passport stamped! Once you have rubbed shoulders with royalty, head west towards Hutt Lagoon, an impressive salt lake with an intense pink hue. Continue the scenic WA Coral Coast route a further 55km to WA’s outdoor holiday playground, Kalbarri. Located within a National Park, the town is encircled by 400 million-year-old gorges and towering coastal cliffs. Red Bluff Road, Kalbarri WA 6536, Australia. A luxury beachfront house, just 100 metres from beautiful Red Bluff Beach. Featuring 3 bedrooms and 2 bathrooms, this fully equipped property sleeps up to 8 people in comfort.